Well, damn, that looks tasty. 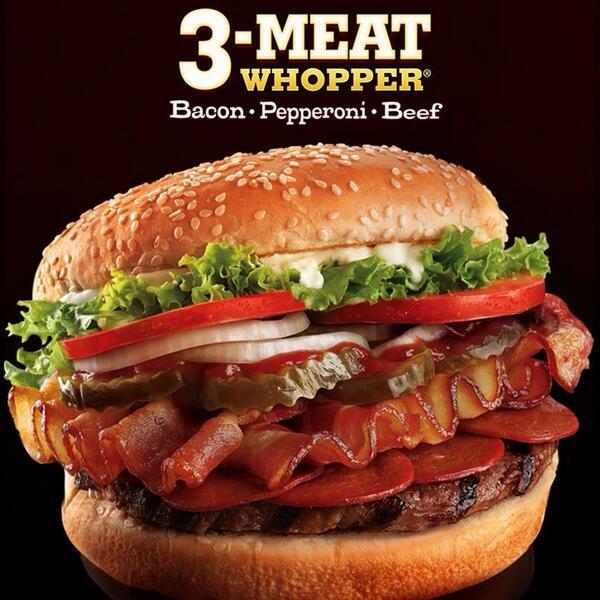 I wasn’t really impressed with their regular whoppers (they were more like hmmm-ers), so I debated between this and the 4-Cheese Whopper. 3 Meats or 4 Cheeses? Eventually, my tummy decided that it wanted more protein that day and so I ordered the burger a la carte which cost me Php160. I don’t like tomatoes on my burger, but I decided to let them stay because they filled out the burger more and I was really hungry. As you can see, a few slices of lettuce, some misplaced onions, and the 3 meats: bacon, pepperoni, and the beef patty. The taste was really good because the meat and the veggies went together astonishingly great. 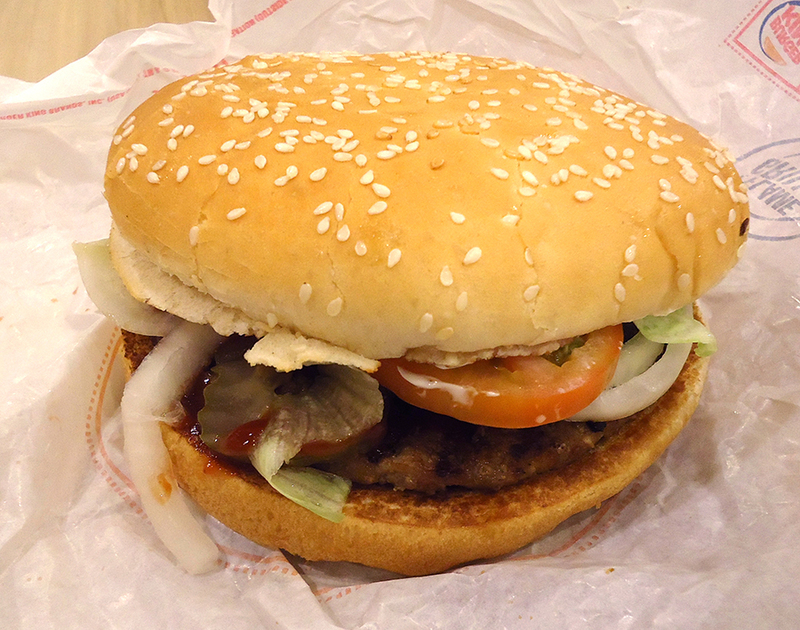 However, I couldn’t really taste the Whopper patty. 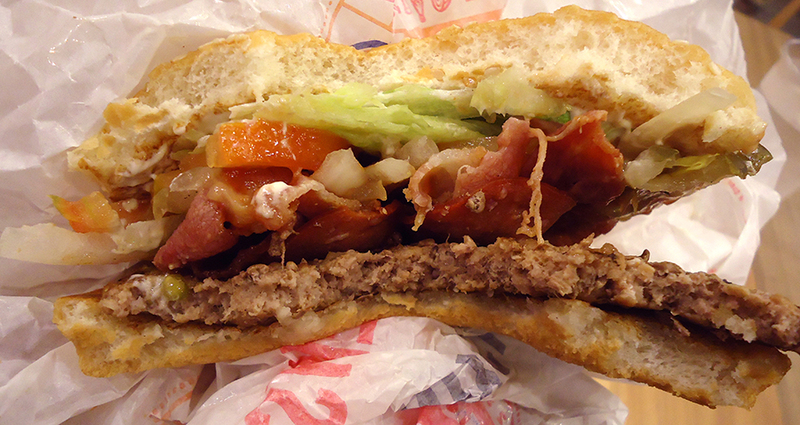 My big gripe about BK is that there (astoundingly thin) patties are really sub-par. They just don’t have that unique taste that patties from other fast-food places have. It is easily overpowered by whatever you pile on top of it (which in this case is the pepperoni and bacon). I’m not saying it’s a bad thing because this burger actually tastes good, but it just doesn’t have something special that makes it Burger King. 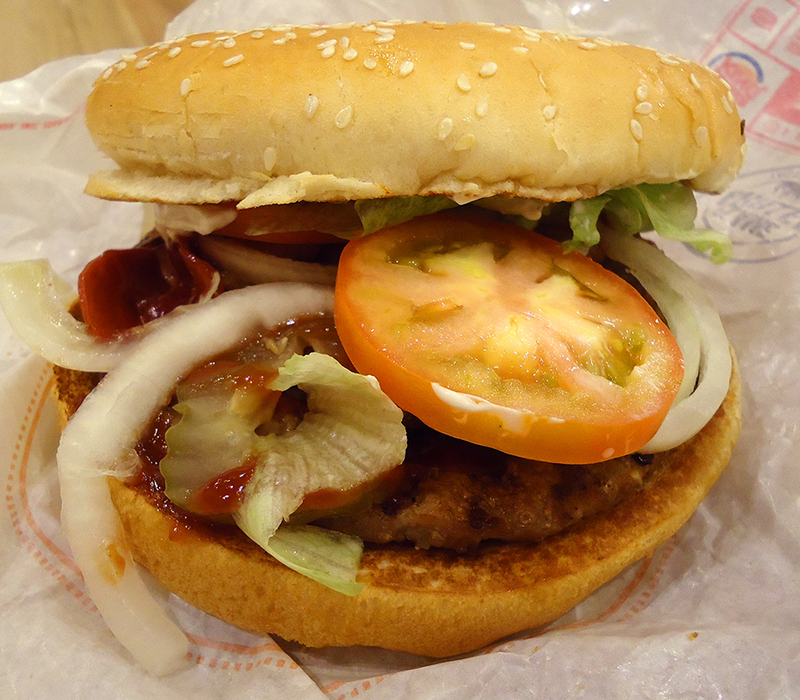 To conclude, Burger King’s 3-Meat Whopper is a good-tasting burger. Not exactly bang-for-bun. Leans more on the pricier side. Maybe if Burger King would change up their Whopper patty recipe and make it thicker and more flavorful, I’d be happier with my purchase. But it was a good experience. I’ll most likely come back to eat again after a couple of years. I hope by then their Whoppers are capable of really “Whopping” me. Next postPadyak: Time to bike!